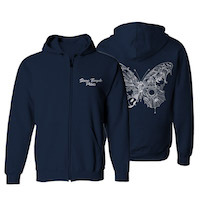 Stone Temple Pilots Butterfly Hoodie Navy zip-up hoodie featuring the Stone Temple Pilots logo on the left chest, and the album Butterfly artwork on the back in white. 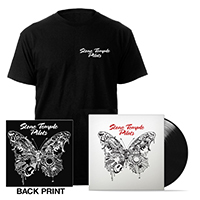 Stone Temple Pilots LP + Tee Bundle This bundle includes the new Stone Temple Pilots album on vinyl, and an exclusive album tee. * Includes instant downloads of "Meadow" and "Roll Me Under."